Your brain is your biggest barrier to success in the markets. It doesn’t have to be this way. Discover ingenious techniques to overcome fear, greed, and the cognitive biases that are sapping your profit potential. Trading should be easy, but sometimes our brains make it tough. It’s not our fault, evolution has hard-wired human beings to fail in the markets. Fear, greed, and other destructive emotions harass us into making poor decisions. Most trading teachers will tell you to “run your winners and cut your losses early,” and “banish fear and greed if you want to succeed.” Great advice, but let’s face it, it’s about as useful as saying “if you want to quit smoking, stop putting cigarettes in your mouth”. If only it was that easy! Anyone who trades knows it can be hard to take a loss or to run a winner. That’s because your brain is actively working against you when you trade. Fear and greed are two of its biggest weapons, and it won’t hesitate to deploy them against your best efforts to turn a profit. But what would happen if, instead of hampering your trading, your fear and greed worked for you? What if you could harness their power and energy and use them for good? Trading would become stress-free, and bigger profits would follow. In this groundbreaking new book, Harvey Walsh goes further than ever before in deconstructing the evolutionary developments and learned behaviours that have programmed us for failure in the markets. Armed with that information, he has developed a series of brain hacks – simple yet powerful tricks and techniques anyone can use to turn around their built-in disadvantages and use them to supercharge their trading. How to make your trading stress-free by subverting your fear-engine. Ingenious brain hacks to boost your performance and profit by commandeering your inbuilt cognitive biases and heuristics. How to harness the awesome power of addiction and have it improve every single trade you take. A simple but smart tactic that will trick your mind into revealing what’s really on a chart. What a racing driver’s pants can teach us about human fallibility, and how that same weakness can become our saviour. How to slay the monsters that haunt every trader, and build an impenetrable shield against self-doubt. The one document every trader needs to improve their entry selection exponentially. What cheat-heuristics are, why they’re good for you, and how to use them ethically. How trading less can mean you make more money. Five different ways to beat the boredom and keep yourself focussed. You can’t profit from a trade you missed, so make sure you don’t miss any. 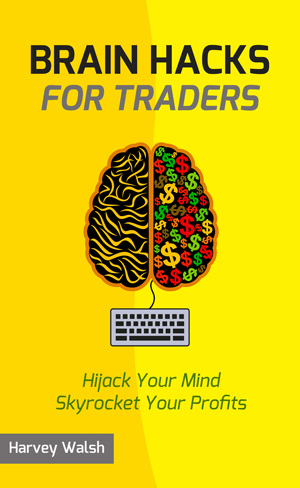 Brain Hacks For Traders is perfect for traders working in any market and any time frame. Scalpers, day traders, and swing traders will all benefit. The techniques in the book apply to any instrument too, be it stocks, futures, forex, options, or commodities. Give yourself an edge: hack your brain and take your trading and your profits to the next level. Because trading needn’t be tough.